Almost anywhere you look in the fitness industry, there is a debate about something. These debates range anywhere from the amount or reps performed in each set, to the amount of weight you should use in exercises, to whether barbells or bodyweight exercises are "better". Today, we are going to look at whether weight benches or Swiss balls are better for your workout. The basic argument for weight benches is that a solid bench provides the foundation you need when lifting weights. A solid foundation becomes more important as the weights get heavier. Having a firm foundation allows you to maintain proper form during the exercise. Proper form is important in exercise, especially when the weights get heavier, because bad form can often lead to injury. As this article from Harvard Medical School suggests, doing an exercise movement with control and proper form is key. Having a good bench while performing chest exercises helps you to maintain proper form and positioning during the exercise. These factors become more important as you start using heavier weights, as the risk factor increases. Having a weight bench can also help you target the chest specifically and enables greater range of motion in exercises than the floor would. The argument for Swiss balls is essentially the exact opposite to that for benches. Proponents of using Swiss balls in exercise argue that the instability provided by the ball is exactly what you need. They claim the instability of the ball is actually beneficial in increasing your core strength and stability. Due to the instability of a Swiss ball, your core muscles have to be firing almost constantly to keep balance. This in turn creates a stronger core, and increases the stability and balance of an exerciser. 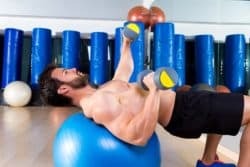 While you can perform a great many exercises with a Swiss ball, and many more than just chest exercises can be performed on weight benches, the argument for them all remains the same: a Swiss ball, due to its instability, forces the core to be in almost constant tension, thus strengthening it. For more information on Swiss balls, as well as some different exercise you can utilize them for, check out this WebMD article. Well, which one is better? The answer to this particular debate is that while the claims made by people who promote Swiss ball training sound nice, there is little actual science to back them up. According to this article on the NCBI website, there is no evidence that using a Swiss ball activates muscles in the trunk any more than using a regular bench. Several exercises were conducted in the study as well which lends it more credence. This example highlights the need to have hard, scientific evidence backing up claims made in relation to exercise. While it seems logical that the core would be activated more by a Swiss ball, there is not enough evidence to support it. This fact seems to break down the fundamental push behind Swiss balls, which is that they produce greater core activation, and thus strength. That said, the study showed that different people responded differently to the instability of the Swiss ball. This could potentially allow certain individuals to benefit more from training with one than others. As a general rule, using a bench is usually a safer and ultimately more constructive approach to gaining strength and muscle mass. This is because you can handle greater loads on a bench, which in turns activates muscle stimulation and growth to a greater degree.